Chester Road crosses the boundary into the old Borough of Sutton Coldfield near the railway bridge, and continues within old Sutton as far as the Beggar’s Bush. From there to Queslet Road it marked the boundary between Sutton and Perry Barr. In the fourteenth century this stretch of road ran across bleak heathland (The Coldfield), the road an ill-defined track, and not for the nervous. In 1323 a rich traveller, Elias le Collier, was robbed of £300, and the authorities failed to catch the thieves. £300 was a fortune in those days, and the Sherriff of the County, having failed to recover the money, was ordered to pay it. But the Sherriff of Warwickshire claimed that that section of Chester Road (then known as the Ridgeway) was in Perry Barr, Staffordshire, while the Staffordshire folk said no, it was in Sutton Coldfield, Warwickshire. In order to protect travellers across the moorland, a guard known as a Bowbearer was appointed to conduct them along the road, and his fee of £3. 3s. 0d was still being paid to the householder of the property responsible for providing the bowbearer in 1800, though there had been no call for his services since medieval times. Chester Road was a drovers road, herds of cattle from as far away as Wales passing through on their way to the London markets. Welshmans Hill is so called because the drovers would camp there overnight, no doubt breakfasting at the Beggar’s Bush Inn. By Statute, the maintenance of main roads such as Chester Road was the responsibility of the parish through which it passed - in 1548 the Sutton court fined Nicholas Spynard and Hugh Sharatt 3s 4d each for failing “to make good the high road to Wales as it passes through their lands”. Eighteenth century landmarks near the road - Gibbet Hill and Jordans Grave - testify to the continued attacks by highwaymen until in 1761 it became part of the Chester to Stonebridge Turnpike. Shortly afterwards the heathland was brought into cultivation, and the road lost its wild aspect. A problem for the Turnpike Trust was poor drainage. In wet weather a lake would form which the road crossed on a causeway - this was known as Baldmore Lake, giving its name to the newly-formed district of Boldmere. When the railway line to Sutton was built, and the road lowered to pass beneath it, the Trustees of the turnpike complained that their road beneath the bridge would often be flooded - and it frequently was. This stunted thorn tree - The Beggar’s Bush - was a landmark on the lonely road. 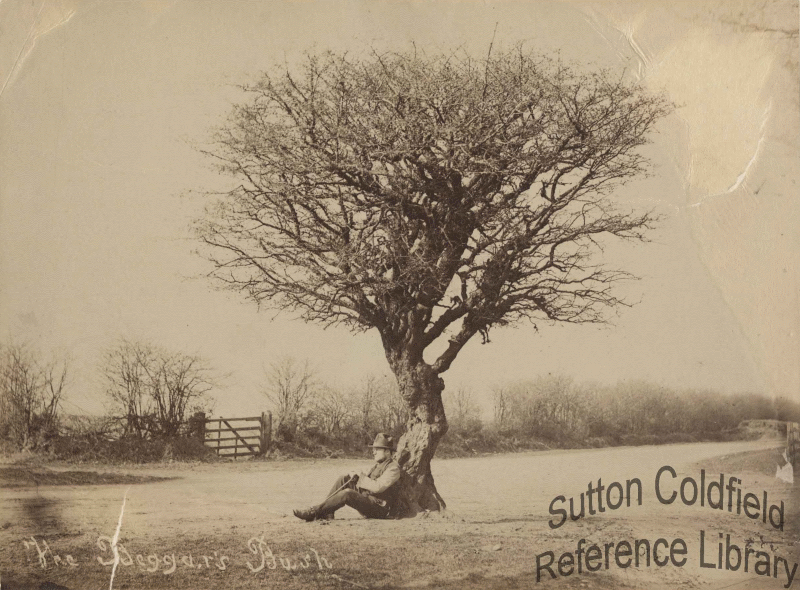 Photo courtesy Sutton Reference Library.